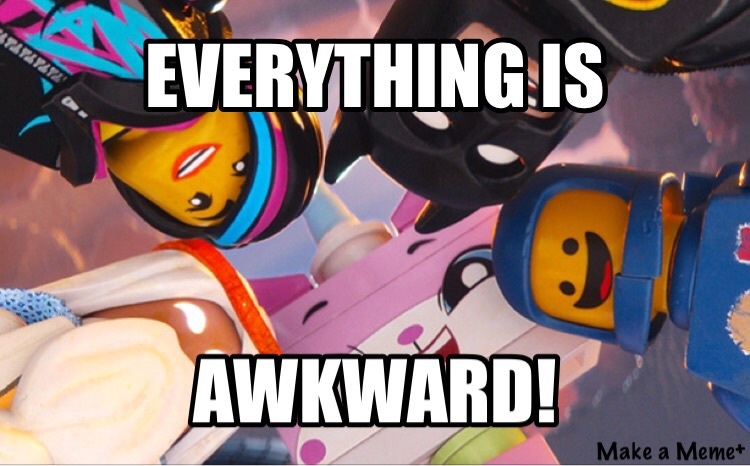 Welcome to the world of being a connected educator were “EVERYTHING IS AWESOME” all day, every day. The truth is, it is really awesome being connected, finding the people who have become my PLN, building those connections, and learning so much. The connections I have made are life altering and I can genuinely say I could not imagine having never developed the relationships that I have made with these many different people. That is the sparkly, glitter filled side that everyone wants to ooh and ahhh about. There is a different side to all this awesomeness that no one ever seems to mention. Before being connected I often felt alone in many ways. I had very few people around me who understood my vision or who shared my philosophies. Because of this, I generally kept to myself about many things I wanted to do or try. I still did them, but most of the time I had people say things like, “I didn’t know where you were going with that, but now that I see it, its great.” That was before I was “unplugged from the Matrix” before I realized I was not alone. Only now that I am not alone, I am still alone. Despite finding others that share my ideas, that are progressive and focussed on growth and improvement, I have found that being connected is also very lonely at times. For whatever their reasons, many people just don’t want to hear about the exciting, awesome things you are learning. They look at your ideas, things you are trying, risks you are taking, and think you have lost your mind. Truthfully I had never strayed from my personal educational philosophy in my classroom until I felt the pressure because I wanted to get off my island and share my ideas with the world. Now, I often feel even less inclined to share ideas locally. Last week I started using my homemade green screen with my class. When I talked about it with excitement I received looks like I should be locked in the nut house for doing this with 1st graders. I know my PLN gets it, I know they are excited to hear about the things I am trying and the work I am doing with younger kids. Unfortunately that has not made my life easier at school. The dangerous thing about being a change agent, the agent that sparks the flames is often burned up in the attempt to ignite the flame. The darkest part of my PLN is that as I try to aspire to the levels of Awesomeness that I see and hear each day, I end up more and more isolated in person. I know my story is not the same as everyone’s, but it is the ugly side of becoming a connected educator. On Saturday I am presenting at EdTechNJ, I have shared this with thousands of people in my life, but none in my school. Follow the Unicorn: Are You Connecting Beyond Education? I have only been a connected educator for about ten months. In that time I have learned many valuable lessons about reflection, education, kids, and many other areas. One of the most valuable lessons I have learned is this: there are great people beyond the education world that we can learn with, and learn from when we connect. A while back I did a series of posts on connected educators that have influenced me this past year. I did not include Art then for various reasons, but I always wanted to make sure I shared a bit more about what he has meant to me. This week, Art LaFlamme hangs up his uniform and joins the rest of us as civilians. He is a Lt. Colonel in the U.S. Army. I can now say I have known two Lt. Colonels, the first was someone I already wrote about during teacher appreciation week last year, and a marine. Both have had a lasting impact on my life. By developing a relationship with Art I have not only gained a friend, but also a unique perspective on so many of education’s issues. Art has spent a career developing plans and teaching them to others. He has made a habit out of mentoring others, finding his own mentors, and taking command of his own professional development. Do these things sound familiar? They should! We talk about them ALL THE TIME! While not everything that the Army does pertains to education, there is so much we can learn by stepping outside of our own sphere. Art is a unicorn as we affectionately call him, because he is rare. He cares about education so much as a parent that he is getting involved, not just at the school level, but on a larger scale. Although he is not alone in doing this, he is most certainly rare. If you look closely, you might see him mythically pop up at Educon this weekend, and hopefully at EdCamp South Jersey in March. If you have the chance to meet him, take it. Art has a way of bringing out both the best (and the strangest) things about you. It is one of his many gifts and time spent talking with him will be time well spent! Follow the unicorns. Step beyond educators on twitter and start connecting with people from all backgrounds. Watch out, you might just learn something! – You can’t see/do EVERYTHING. I am among the many connected educators with Yes disease. I say yes to nearly every project, request for information and challenge. It took me a while to realize I cannot do it all. I need to be more selective and decide what is most important to me in order to make sure I spend my limited time wisely. – It’s ok to disagree! Some of the best conversations and the most interesting people I follow are people with whom I generally disagree. – This is perhaps my most important lesson of all: You need to find your people. Being connected isn’t about building a PLN like a house, it is more like building a home. Your PLN is about the relationships. It is really about how and not who. It is about how you develop the relationships with your PLN, not who you add. If you are not creating meaningful relationships then things like twitter become overwhelming and fail to meet their goal. You cannot just build up a PLN by adding people who you have seen or know. You have to engage with them, learn about them not just with them. That is how you get the most out of PLNs. I have seen the benefits of giving kids their voice. I have seen the power behind allowing kids to expand, grow, gain confidence, and share with the world. I think however, that in our excitement in helping children find a way to impress who they are and who they want to be upon the world, we can lose sight of a very important, powerful thing: LISTENING. I find myself guilty of this far too often. There is incredible power in the ability to close one’s mouth long enough to really hear things. I have grown to learn that the more often I listen, the more I learn. Generally, throughout my life I have learned most through interaction, but a part of me wonders how much of the responses of others I genuinely listened to and how much of it was me waiting to retort. As a student, usually I knew what the answer would be before I asked the question and I would lead the discussion in the direction I was heading. Sure, this method allowed me to learn and process quite a lot, but imagine how much more I could have learned if I really listened to the answers before opening my mouth again. If you really want to learn, ask an open-ended question, then begin listening. Don’t anticipate the answer, just listen and maybe, you might just learn more about others and yourself than you planned. 2014 was in incredible year for me, personally and professionally. Like any other year it was filled with many highs and lows, but I have come out the other side feeling empowered to do great things in 2015. I have read many other people sharing their #oneword for 2015, and so I felt inspired by their great ideas to share mine. This past year was one where others have given me so much. They have created opportunity, encouraged, taught, and shared so much with me, that I want to give back what I have been given in far greater proportion. I want to be a reason other educators, leaders, parents, and most of all kids feel the great, renewed sense of excitement I have developed for education. I want to spark the passions of others and know that they will in turn become great at whatever it is they choose to do. Most of all, I want to give others the ability to create, grow, and shine! Empower others to greatness (whatever that means) in whatever ways possible. This year I have had so many people empower me with so many great things. It is time to give that opportunity back to others!